Success at A Level or International Baccalaureate (IB) allows you to choose the right university and degree from every UK university and many other top universities worldwide. 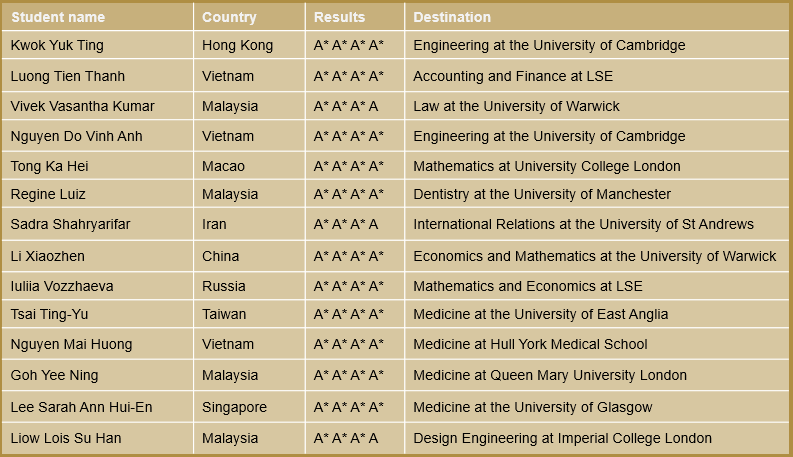 ‘Advanced Levels’ are the UK public university entrance examinations and are recognised worldwide. UK A Levels give you the in-depth preparation you need to excel in the most demanding and competitive degree courses. A level students usually have a clear idea of the subject they want to study at university. You can choose from a wide range of subjects including science, maths, languages, humanities and the arts. A-levels will allow you to gain entry to the most competitive degree courses at the full range of UK universities. A level classes are kept small. You will benefit from the close personal attention of a teacher who is a dedicated expert in their academic field. You will study Key Skills and Critical Thinking, along with four subjects on the five or six-term programme and three or four subjects on the three-term program. IB stands for International Baccalaureate. It is for motivated students interested in a broad range of subjects, who may not yet have decided what they want to specialize in at University. IB students usually have a strong interest in the world around them and current affairs. They are expected to work hard and take part in social and cultural activities as well as academic study. The IB program provides a broad overview of subjects from a range of disciplines, including science, languages, humanities and the arts. It is ideal for students who have a wide range of interests, and who want to explore these interests further before specializing at university. Assessment: Final exams at the end of two years, plus coursework, CAS, extended essay and presentations. If you have exceptional academic ability, your ambition might be to graduate to either Oxford or Cambridge University or a UK medical school. These institutions are some of the most competitive in the world. You will need specialist preparation in addition to your excellent academic qualifications. Some college offer this tailor-made oxbridge preparation for the very best students on the A Level program or IB Program. Additional classes in Maths, Economics and Physics for students applying for these subjects and who may have to take a STEP (Sixth Term Examination Paper) or the AEA (Advanced Extension Award). Preparation for the UKCAT and BMAT medical entry tests. Students applying to read Medicine also have weekly meetings where they can study the college guide to applying for Medicine, give talks on topical issues in Medicine, arrange to undertake voluntary work in hospitals, clinics or old people’s homes and report back to the group on their experiences, and discuss the kind of questions asked at interview. At Bellerbys we have a 20-year record of exceptional A Level results. It is proof of the excellent teaching and support each of our students receives – coupled with the hard work and dedication of the students themselves. This year, Bellerbys A Level students – across all centres – achieved first-class A Level results, proving yet again that Bellerbys College is the very best route to a top UK university for international students. For more information about Bellerbys college, please read more: Bellerbys College. International Baccalaureate students continue to bring a real vibrancy to CATS College Canterbury as many graduate this year with excellent point scores and destinations to be proud of. Highest Diploma point score achieved was 41 (equivalent to A*A*AAA at A level). Are you comparing Foundation Program to A level program? Are you confused? Are you unsure about which foundation program is good? Come and have a chat with Mr. David Few. It’s exclusively available in Singapore. Mr. Few is formerly the Principal of Bellerbys College (Cambridge), the Global Admission Director and the Global Recruitment Director for Bellerbys College. He is now the Business Development director of JACK StudyAbroad and would be more than happy to advise students and parents from Singapore. The topics covers comparison of Foundation program and A level program, different foundation programs in the UK and career planning for O level graduates. Read more and make appointment here: Meet Mr. Few in Singapore.